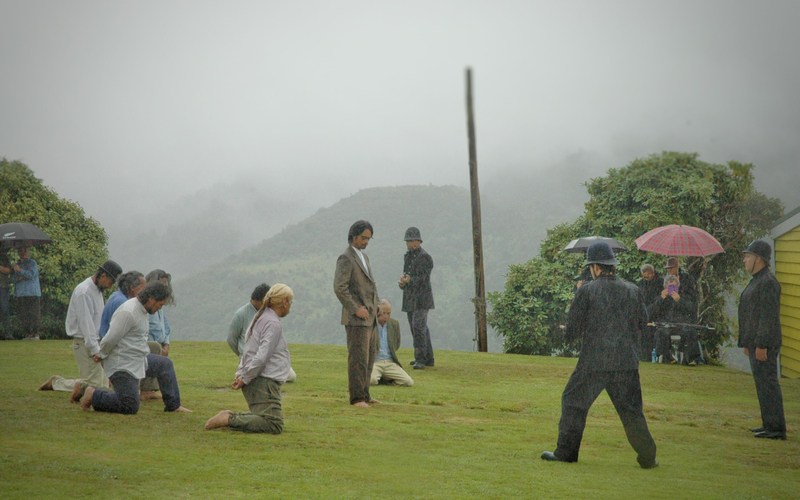 A re-enactment of the arrest of Rua Kēnana at Maungapōhatu. Image courtesy of RNZ / Edward Gay. During the First World War New Zealand society became intensely patriotic, but also sharply intolerant. People who were regarded as unconventional but harmless before the war became targets for extreme state repression. One of those people was the Tūhoe prophetic leader Rua Kēnana, who was arrested in 1916 at Maungapōhatu, deep inside the Urewera forest. 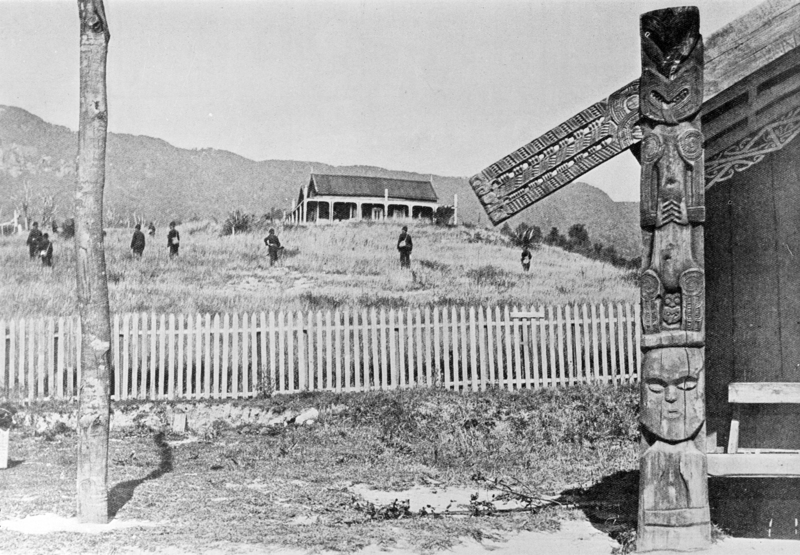 Rua had founded his religious community at Maungapōhatu in 1907, giving his followers hope that their confiscated lands and lost mana would be restored. The Maungapōhatu community was well ordered and progressive, with its own savings bank and co-operative store. However, many Pākehā saw it as sinister, and believed Rua was holding back Māori progress. With the outbreak of the First World War, his influence came to be seen as dangerous. He was held responsible for the low numbers of Tūhoe who volunteered to fight for the British Empire, although other tribes whose land had also been confiscated after the nineteenth-century New Zealand Wars were just as reluctant to enlist. Rua’s religious principles were based on pacifism, and equality for Māori under the law. However, wild rumours circulated about him in the press. He was said to welcome a German victory in the war, and to be building up a well-armed force to support the Kaiser. Preparing for hostilities, the police party checks their arms and ammunition at Ruatahuna, prior to marching into Rua’s community at Maungapōhatu, 1 April 1916. Photogapher: A N Breckon. Sir George Grey Special Collections, Auckland Libraries, 7-A3319 and 7-A3319a. Members of the armed constabulary advancing closer to Hiruharama, Rua's house at Maungapōhatu while shooting was in progress. Photogapher: A N Breckon. Sir George Grey Special Collections, Auckland Libraries, 7-A3792. Eventually, liquor licensing laws were used as a pretext for police intervention. Some years earlier, Rua had been charged with illegally selling alcohol, since Māori were not permitted to hold a liquor licence. In early 1916 he was summoned to face these historic charges. He refused to go with the arresting officers and in his halting English, made angry and ambiguous comments about the British King. These formed the basis for a new charge against him on the far more serious offence of sedition. In March 1916 a massive police operation was organised to arrest Rua, led by the Police Commissioner, John Cullen, in person. “I was entitled to go armed to a man whom I knew to be a desperado”, Cullen said later, and he ordered a large number of automatic pistols and ammunition for his men. Almost 60 police officers were selected for the expedition, from as far away as Invercargill. They reached Maungapōhatu, after a two-day tramp along steep bush tracks, around noon on Sunday 2 April 1916. 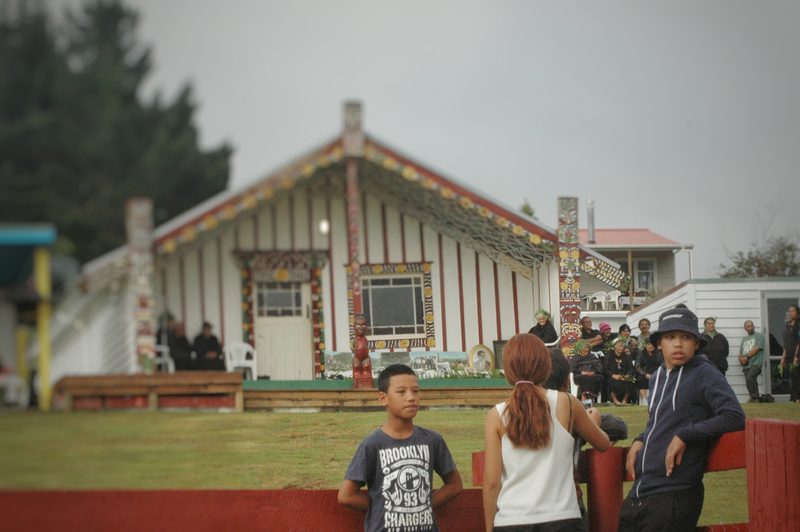 In accordance with Māori custom, Rua expected the Police Commissioner to come onto his marae with one or two officers for a formal kōrero, while the rest of the police party waited to join them. However, Cullen rode his horse onto the marae with dozens of armed constables close behind. Rua called out “He pū era. He kino!” (“They have guns. That’s evil!”) and, with his two sons, turned and ran, pursued by police who threw him to the ground. A gunshot rang out across the marae. Who fired, and from which direction, has never been established, but the shot signaled the start of a general gun battle. When the firing died down, Rua’s son Toko and his uncle Te Maipi lay dead. Many other Māori and four policemen were wounded. 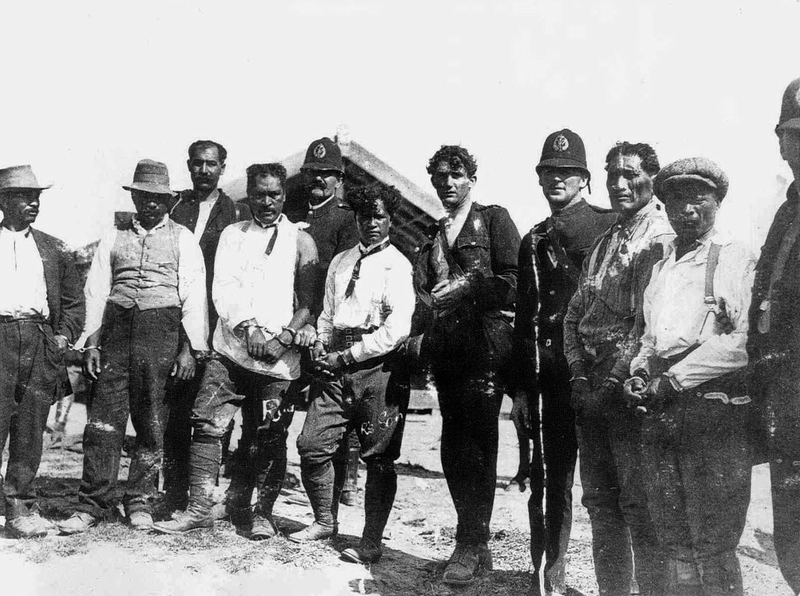 Police Commissioner John Cullen leads his prisoners from Maungapōhatu after the police raid. Rua, handcuffed and wearing a white shirt, walks at his stirrup. Five other prisoners follow behind. Photogapher: A N Breckon. Sir George Grey Special Collections, Auckland Libraries, 7-A3315. 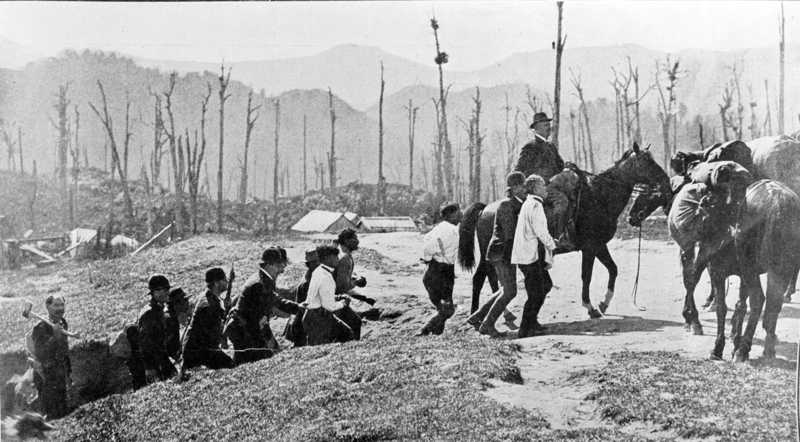 Under armed police guard, Rua’s wives and other women and children are led down from Hiruharama Hou. They were held in the open for several hours during the raid. Photogapher: A N Breckon. Sir George Grey Special Collections, Auckland Libraries, 7-A3791. Rua was taken to court in Auckland and charged with numerous offences, including sedition. Most of the charges collapsed because of legal flaws in the arresting procedure. The jury also threw out the charge of sedition, but found Rua ‘morally’ guilty of resisting arrest. He was sentenced to a year's hard labour, followed by 18 months' imprisonment. In April 1918 Rua returned to his community after serving a total of 18 months in Mt Eden Prison. He was rumoured to have made a deal with the government to drop his opposition to conscription in return for an early release, and indeed, now encouraged his people to enlist for the war. About 50 of his followers did so. Most of them, however, were either very young, elderly or disabled, and therefore not prime military material. Rua prophesised that when these volunteers went to Auckland for training, the war would end, and that is what happened. Although a number of his followers began training at the army’s Narrow Neck Camp in Devonport, none were sent overseas to fight. 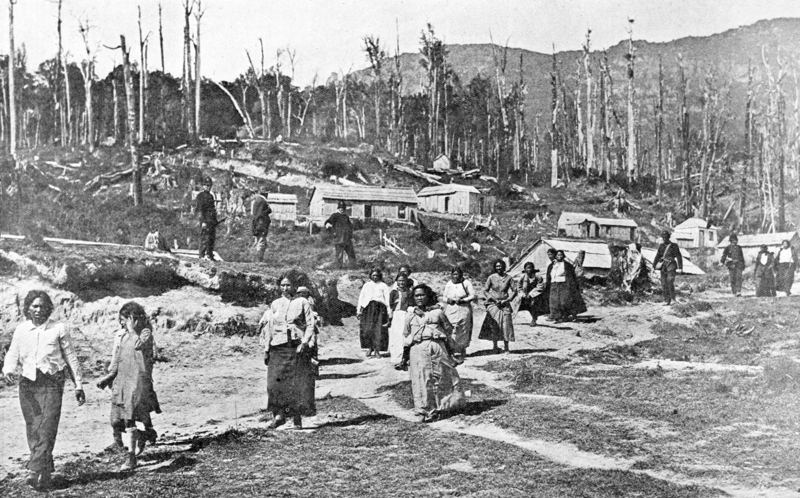 The fatal 1916 raid on Maungapōhatu remains a bitter memory for Tūhoe people today. In the 1980s the police made an apology to Rua’s descendants, but that did not erase the resentment they felt. A hundred years after the raid, in April 2016, gunshots again rang out across the marae at Maungapōhatu, as the events of the raid were re-enacted. Descendants of Rua and his followers, and even of some of the police involved, took part in this re-enactment, and headstones for Toko and Te Maipi were unveiled. A re-enactment of the arrest of Rua Kēnana at Maungapōhatu from April 2016. Image courtesy of RNZ / Edward Gay. Maungapōhatu marae, in the heart of Te Urewera. Image courtesy of RNZ / Edward Gay.